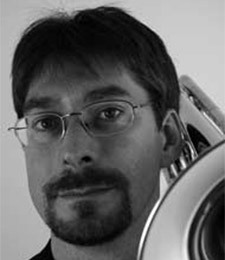 Bass trombonist Mark Hoelscher is a member of the Chicago-based Millar Brass Ensemble and is an Edwards artist/clinician. He freelances with groups in the Chicago, Milwaukee, and Madison areas and is an active teacher and coach. Mark holds a Master's Degree in trombone performance from Kent State University and an undergraduate degree in trombone from Wichita State University. As a fellowship recipient at the Aspen Music Festival, he performed with the Festival Jazz Ensemble, Chamber Symphony and Festival Orchestra and studied chamber music with American Brass Quintet. He is an active studio musician and has toured nationally and internationally with classical and pops orchestras, as well as big bands and touring shows. Hoelscher has performed with the Hamilton Philharmonic and Symphony Hamilton (Hamilton Ontario, Canada), the Canton Symphony, and was a member of the Wichita Symphony. Since moving to Milwaukee in 1993, he has performed with such groups as the Chicago Sinfonietta, Milwaukee Symphony, Elgin Symphony, Chicago Civic Orchestra, Milwaukee Ballet Orchestra, Present Music, Madison Symphony Orchestra, and the Wisconsin Chamber Orchestra.